Between 1890 and 1930, about 6,000 carousels were made in the United States. Hartford, Connecticut, is fortunate to claim one of the only 200 or so that remain today. The Bushnell Park Carousel dates to about 1914, and it is operated and maintained by the New England Carousel Museum, with funding provided by the City of Hartford. The museum is located at 95 Riverside Avenue in Bristol, Connecticut, but the historic carousel, which still whisks riders young and old on a merry go-round, is located in downtown Hartford in Bushnell Park. At just $1 per ride, a carousel visit is an affordable, old-fashioned family outing. It's also a lesson in history. The Bushnell Park Carousel was created by Stein and Goldstein, owners of the Artistic Carousel Company of Brooklyn, New York. It operated in Albany, New York, from 1914 until 1940. Then, it was relocated to the Meyers Lake Amusement Park in Canton, Ohio. In 1974, the Knox Foundation brought the historic carousel to Hartford, where restoration work took place in 1980 and in 1989. 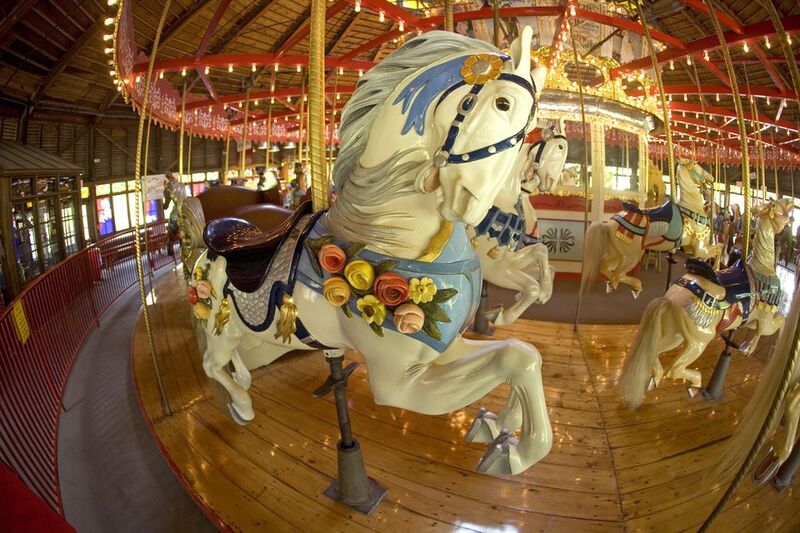 Today, only three carousels hand-carved by the Russian immigrants, Solomon Stein and Harry Goldstein, remain intact, and Hartford's prized carousel is one of them. The antique merry-go-round features 36 jumper horses, 12 stander horses, two chariots and a Wurlitzer 153 band organ, which grinds out tinkling carousel tunes that hearken back to yesteryear. In the fall of 2015, construction was completed on the carousel's pavilion, transforming this treasure into a year-round attraction with restrooms on-site. In addition to being open to the public every day except Monday in season and Friday, Saturday and Sunday year-round, the Bushnell Park Carousel may also be rented for private, special events during non-public hours. Yankee Magazine named Bushnell Park Carousel one of Connecticut's best classic attractions in 2015. Getting There: The Bushnell Park Carousel is located in Bushnell Park in downtown Hartford, Connecticut. From I-84 West, take exit 48A. At the end of the exit ramp, make a right onto Asylum Street. Keep right, following the edge of the Park through Memorial Arch, and you will see the carousel on your left. From I-84 East, take exit 48 and turn left at the end of the exit ramp onto Asylum Street. Keep right, following the edge of the Park through Memorial Arch, and you will see the carousel on your left. This map of the area around Bushnell Park will help you find your way. Parking: If you're lucky, you may find on-street parking on Trinity Street or Elm Street. Several public parking lots and garages are also located nearby. Hours: As of fall 2015, the Bushnell Park Carousel is open from 11 a.m. until 5 p.m. Saturday and Sunday. Admission: The cost is $1 per ride. There is no charge to simply view the antique carousel. For more information: Call 860-585-5411. Love Historic Carousels? Consider becoming a member of the Friends of the Carousel.